There are Fox News Neanderthals in every country. When we talked about closing reactors in Bulgaria or Germany we would often hear that without these plants the lights would go out. The Fukushima meltdowns have proven otherwise and in my mind not just for Japan. Since shortly after the 3 meltdowns on March 11, Japan has been instituting a national energy conservation campaign (which is called Setsuden). It has raised the weekday rates for power (which has caused heavy industry to start working on the weekends to avoid these costs). It has raised the air conditioning temperature (which has created the “super cool business style” in which business men take off their western suits and wear short sleeve shirts instead). Japan is idling some elevators and escalators and cutting back on lighting and fans. And the country has made energy-saving something of an obsession. And while some additional fossil fuel plants have been brought back on-line, but mostly it is conservation which is leading the way. The conservation effort is so successful that with 38 of 54 nuclear power plants shut down, there is regularly enough surplus energy in Japan now to run Manhattan. No rolling black outs and no recession means Japan is starting to think that it might be able to get by without nuclear, something which was generally unthinkable just 4 months ago. Recent polls show 2/3s of the country want to phase out of nuclear. Risking copywrong infringement here is the article B cant see because of her NYC IP address. TOKYO—When the March 11 tsunami knocked out more than half of the nuclear power plants serving the Tokyo area, it set off one of the biggest unplanned experiments in a modern society: Could a metropolis of 30 million people get by after losing about a fifth of its power supply? After a steaming July in Japan filled with 90-degree-plus days, the preliminary answer is in, and it is yes. Not only has Tokyo Electric Power Co. kept the lights on all summer, it has so much extra capacity on most days that it could power New York City, too. The economic hit from power shortages that many feared has failed to materialize. Japanese stock prices have risen almost to their prequake levels, the economy is growing again and some companies have actually been invigorated by the demand for electricity-saving goods. Saving electricity has become a sort of national religion. With many air conditioners set at 82 degrees, businessmen have shed their usual suits in favor of “super cool biz” short-sleeve shirts. Car makers have been forced to operate on weekends to avoid sucking up electricity during peak weekday hours. Peak electricity usage for the Tokyo area so far this summer was nearly 23% below the peak last summer. The drop in electrical consumption is shaking Japan’s decades-old commitment to nuclear power, which until this year supplied nearly 30% of its electricity. If the country successfully navigates the remaining weeks of the summer with a reduced power supply, the Fukushima Daiichi accident is likely to transform Japan’s energy policy. That will have global implications as nations review nuclear power in light of the worst radiation release since Chernobyl. There’s a growing sense that Japan will rely less and less on nuclear plants and may phase them out entirely some day, politicians and many business executives say. Germany and Switzerland have announced their own phase-out plans, while leaders of the U.S. and France, the two biggest nuclear-power users, say they plan to keep their reactors running. “Over the mid- to long-term, it is desirable to move toward shrinking nuclear power by phasing out aging reactors and promoting renewable energy,” said a statement by the Japan Association of Corporate Executives after its summer meeting in July. Others go even further. “I think it’s better without nuclear energy” in principle, said Hiroshi Mikitani, the 46-year-old billionaire head of Internet shopping company Rakuten Inc., and one of the most prominent leaders of a rising generation of Japanese business executives. Mr. Mikitani cautioned that he doesn’t favor shutting down all nuclear plants at once. But he said the summer has shattered the trust that Japanese once held in the nuclear establishment. 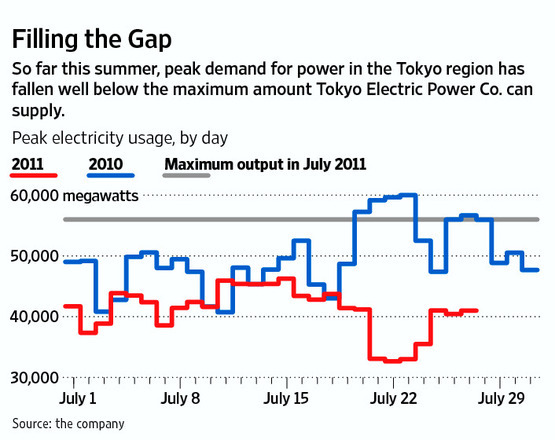 Japan’s success in avoiding a power crunch owes both to greater supply and less demand. Tokyo Electric Power, known as Tepco, raced to revive older gas- and coal-fired plants, putting a quick stop to rolling blackouts that Tokyo suffered a few days after the earthquake. Meanwhile, the conservation drive has reduced peak demand in the Tokyo area by 10,000 megawatts or more on many days. These steps have drawbacks. The traditional power plants emit more greenhouse gases, and Japan must import the fuel. That increases energy costs, although the strong yen eases the burden. And some elderly people are taking the conservation effort too far, risking heat stroke. At the Imperial Palace, the emperor and empress, both in their late 70s, at one point were getting by with candles and flashlights at night, according to a palace spokesman. Emergency responders have brought 22,418 people with heat stroke to medical facilities this summer through July 24, according to Japan’s Fire and Disaster Management Agency. Nearly half were elderly, and 43 people died. The number of people with heat stroke is running more than 50% ahead of last year, but the number of deaths is one-third lower. Still, for such a tremendous cut in energy usage—the savings are roughly equal to the entire power demand of Consolidated Edison Inc.’s unit serving New York City and Westchester County—the economic damage seems relatively small. The vice governor of the Bank of Japan, Hirohide Yamaguchi, said July 20 that power issues are “not likely to constrain economic activity to the extent expected earlier,” and the central bank is predicting a moderate recovery this fall and 2.9% growth next year. The capital is mostly humming as usual, with lines at electronics stores and packed trains to resort areas. By themselves, the earthquake and tsunami brought significant damage only to Tepco’s Fukushima Daiichi nuclear plant, which has six reactors. The company also shut down the nearby Fukushima Daini plant with four reactors. 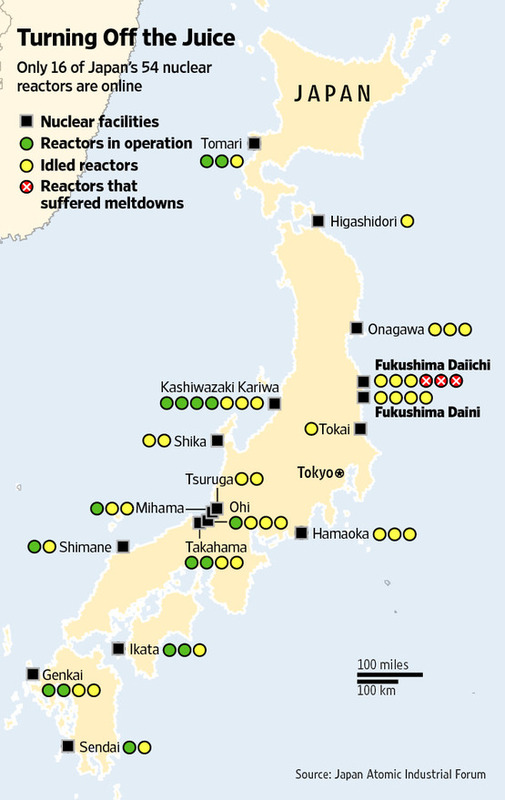 The vast majority of Japan’s 54 nuclear reactors suffered no damage in the quake. But to the surprise of power companies, communities started balking at restarting reactors that were idled for routine inspections. Then Prime Minister Naoto Kan announced a series of stress tests to check reactors’ vulnerability to accidents, further delaying the restarts. 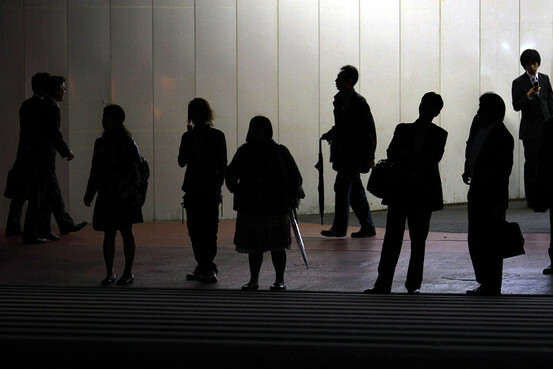 Bloomberg News Pedestrians stand in the dark as they wait to cross a Tokyo intersection — part of a power-saving drive. Now only 16 reactors are still running, and all of them are scheduled to be idled for routine inspections by next spring. 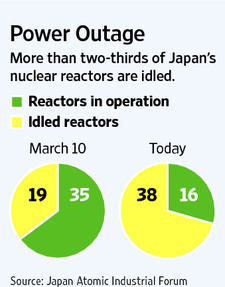 If it fails to restart halted reactors, Japan will be without nuclear power in less than nine months. That would create another power crunch when demand rises again in the summer of 2012, and Japanese are debating whether going cold-turkey on nuclear power is possible. If people continue their conservation and power companies crank up their aging fossil fuel-fired plants for another summer, Japan could probably make it without power outages. But backers of nuclear power say it would be foolhardy to try. The quickly dwindling supply of nuclear power has forced other regions to conserve. Only four of 11 reactors serving Japan’s second-biggest economic center, the Kansai region around Osaka, remain online. At a restroom in Kansai Electric Power Co.’s headquarters, the electric hand dryer is turned off and a sign asks people to dry their hands with a towel purchased from a 100-yen ($1.25) store. Power companies and some business leaders argue that this summer’s success is an anomaly that can’t or shouldn’t be repeated. Yoshihito Iwama, who heads environmental policy at the big-business lobby Keidanren, said companies are paying extra to generate power at in-house facilities and hesitant to invest because of uncertainty. But skepticism has grown about the alliance of power companies, the industry ministry and big businesses promoting nuclear power. Public opinion is running 2-to-1 in favor of reducing or eliminating nuclear power plants, according to a July poll by public broadcaster NHK. Even the opposition Liberal Democratic Party, a stalwart supporter of nuclear power during the decades it ran Japan, is reassessing its view to ensure its candidates don’t get attacked over the issue. Self-inflicted lapses have weakened the pro-nuclear power camp. A power company in southern Japan asked employees to impersonate average citizens and send in emails supporting nuclear power to a televised debate. The company’s president has said he will resign to take responsibility for the ploy. The industry ministry’s chief nuclear spokesman was replaced suddenly after it was revealed he was having an affair amid the crisis with another ministry official. Mr. Mikitani, the Internet-shopping tycoon, pulled his company out of Keidanren in July. “They are protecting the interests of specific industries, which is not good for…the Japanese economy,” he said. Rakuten said it reduced its power usage by 35% with steps such as turning off office lights and controlling the heat emitted by computer servers. It was “not that difficult,” Mr. Mikitani said. Tepco’s dire forecasts of power shortages, followed by the news that power was actually in plentiful supply, increased his suspicions. Tepco says its figures are accurate and it is trying its utmost to raise supply, but it believes power could fall short if people don’t conserve. “We’re still not in a situation where we can be optimistic,” a spokeswoman said. Discussion has begun in Japan over what is termed “datsu-genpatsu” or “shedding nuclear power.” The nation’s most influential newspaper, the Asahi Shimbun, published an editorial of some 5,000 words laying out its datsu-genpatsu plan. The Asahi said Japan should rely more heavily in the short term on liquefied natural gas, including imports from the U.S., while developing renewable sources such as solar and geothermal power for the longer term. A law pending in parliament, pushed by Prime Minister Kan, would guarantee producers of renewable power that they could sell their electricity at a profitable price. Many companies are already acting as if the summer of 2011’s experiment with dropping reliance on nuclear power will continue in future summers. In July, companies such as Panasonic Corp. and Sharp Corp. said they will team up to develop standards for solar-powered homes that store their own energy and don’t need help from the grid. A Japanese alliance led by trading company Mitsubishi Corp. is investing billions to develop infrastructure in Canada that could deliver liquefied natural gas across the Pacific later this decade. And three-quarters of Japan’s governors have joined telecommunications billionaire Masayoshi Son, chief executive of Softbank Corp., in a plan for giant solar-power plants on unused farms and industrial land. The moves toward shedding nuclear power will carry significant costs. Japan’s electricity bills are sure to rise in the short term if nuclear power is replaced by imported fuels and more-expensive renewable sources. Rural areas that play host to nuclear plants would lose their main source of jobs and tax revenue, and power companies would have to write off the billions of dollars invested in the plants. And, as the Asahi acknowledged, the shift will place demands on consumers. “We will have to overhaul the long-established attitude that we can use as much electricity as we like and view the supply as someone else’s problem,” the newspaper said. Thanks for the info. I’d like to add that the nuclear industry is tied to the war machine. Two filthy businesses that should be put out of business as soon as possible.